in:play is a music player app that accesses your iTunes music library—but the big differentiator between the iOS Music player and in:play is its beautifully designed, typographic interface. The clean, minimalist design is spare but includes all the features you’d expect and some clever extras you wouldn’t. The iOS Music player app has buttons across the bottom of the screen: Playlists, Artists, Songs, Albums, Genres, and others. When in its more traditional full selection mode, in:play has the same selection of buttons at the bottom of its screen. 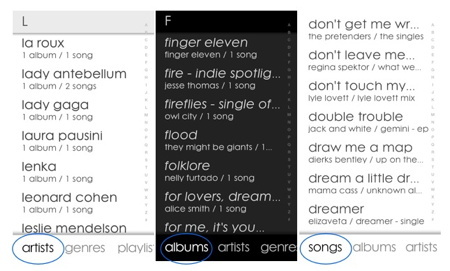 However, in:play‘s Deep Context searching allows you to drill down into your library. This permits searching first by one category and then another. Say you what to hear a specific song. You can play everything in your library by that artist, everything on a specific album or just that song with just a few taps. Once you’ve found the song, it begins to play immediately. There are quite a number of new gestures to learn and they take time to master: Swipe down from the top (but not the very top where the Notifications tab hides) to enter the full selection mode; tap anywhere to play and pause; swipe forward and back through the current queue; tap and slide your finger on the Artist/Song/Album list to switch from playing all of your library to just songs by the current artist or album. Because the interface is gesture-driven, a screen lock to prevent accidental tapping will be a useful addition in a future update. When a song is playing, there is a row of media controls at the bottom of the screen: Volume, Airplay, Shuffle, and a nice day/night mode making the background bright white or jet black. In either case, the typography is beautiful and titles are clearly visible. 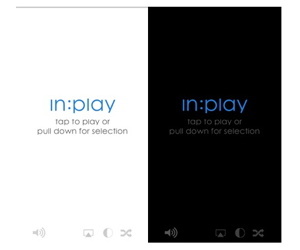 in:play includes a built-in re:playlist creator. Tap with two fingers to add the current song to your re:playlist. 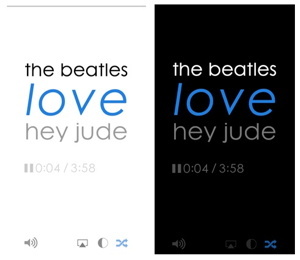 You can also swipe a song or album on the the selection screens to add it to your re:playlist. Deleting songs from this playlist is easy, once you discover how to do it. in:play is not really necessary, as the homely but familiar Music player included in iOS will perform most of the same functions. However, in:play‘s interface is gorgeous and once you learn how to use it, going back is difficult. Deciding whether to spend $1.99 for the app depends largely on how much you listen to music on your iPhone. If you listen to music with any frequency, you’ll like this app.